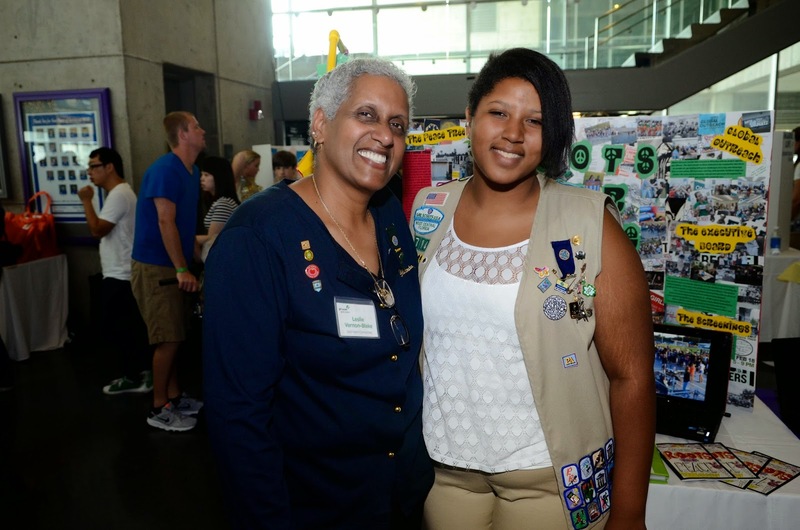 With recruitment in full-swing, we are continuing our series that will share stories about some of our amazing volunteers with the entire Girl Scouts community. There are 30,000 girls waiting for the chance to be a Girl Scout, so the time is now to build our volunteer force! These exceptional people prove that anyone can be a Girl Scout volunteer: they are young professionals, senior citizens, men, and so much more. And 88% of Girl Scout volunteers believe their lives are better because they volunteer. So what are you waiting for? Volunteer today! Like many parents, Leslie Blake wanted to pass on the things she loved as a child to her three daughters. But none stood out more than her favorite childhood activity: Girl Scouts. Judging by the current whereabouts of her daughters, it seems Girl Scouts instilled a spirit of service and togetherness that persists to this day. Leslie’s oldest daughter, Aisha, graduated college and is doing a year of service in Detroit; and her middle daughter, Jamila, a junior at the University of Delaware, was selected as a National Young Woman of Distinction in 2013. For example, they worked on resumes while having a pizza party, as most of the girls were evaluating where they wanted to go to college. “They’re more creative than I could ever be,” said Leslie, deflecting all praise to her troop. She remembered one shy girl who blossomed into a confident young woman. “I watched her go from a girl who was uncomfortable talking around her peers, to being onstage with a theater troupe and dancing solo at different events. Years later she let me know that her experience in Girl Scouts helped her test the boundaries of what she could do.” That girl is just one example out of many who have been positively impacted by Girl Scouts. She absolutely will not be the last.